This activity has seven pages, 3 worksheets, 3 answer Keys, and the Directions/Cover page. 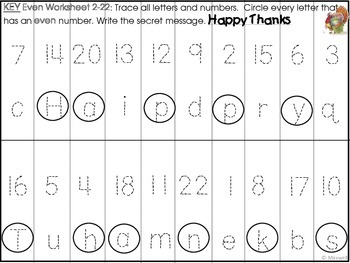 The even number worksheet includes the numbers to 22 and spells out "Happy Thanks." 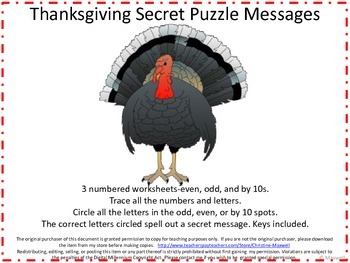 The odd number worksheet includes the numbers to 23 and spells out "gobble turkey." 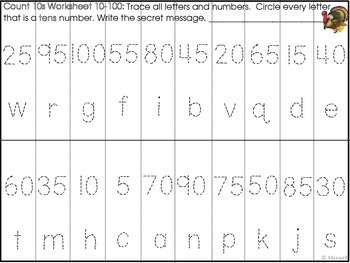 The numbers by 10 worksheet includes the numbers to 100 and spells out the message "give thanks." 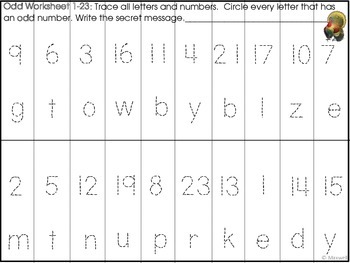 All the numbers and letters are dotted and can be traced. Circle all the letters in the odd, even, or by 10 numbers. The correct letters circled spell out a secret message! Click on the Download Preview Button to see the complete activity. Please leave feedback and enjoy!